As the third son of the Duke of Fordham, Alex never thought he’d become a duke. But he’s suddenly catapulted to the lofty title after his slightly older brother dies in his sleep. Now Alex has the onerous task of announcing the death to the woman his brother was to wed. Ever pragmatic, Lady Georgiana Fenton insists on seeing the late duke’s body, and when she does, she’s convinced he was smothered as he slept. She and the new duke decide to secretly work together to uncover the murderer. 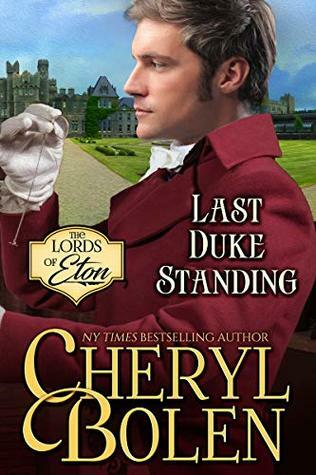 But the longer they’re together, the harder it becomes to resist the duke’s scorching kisses–and even harder to dismiss him from the list of suspects. No one had more to gain by her fiancé’s death. . .
As I come to the end of The Lords of Eton trilogy, I find myself wishing two very different things: 1) I wish the Lords of Eton had a great many more friends so the series can go on and, 2) I am so glad the series is limited to these three alone as it is such a strong series that I have truly enjoyed. Alex never considered he would become the Duke of Fordham; as the third son, his role was never meant to be a leader but as circumstances and life have shown, situations can change quickly and without warning. In the wake of the untimely deaths of his two elder brothers, Alex has assumed the title of Duke of Fordham and he must now readjust his thinking and his life to accommodate his new role. In a most unfortunate turn, Alex’s first act as Duke of Fordham is to inform his brother’s betrothed of his death. Lady Georgiana Fenton is not to be trifled with. As the first born among her siblings, she has always, despite her small stature, been a forceful and somewhat aggressive woman with a fierce intelligence behind her actions. She is pragmatic, somewhat stoic and not at all accepting of the explanation of the cause of her fiancé’s death. In fact, Lady Georgiana is certain he was murdered and with the help of the new duke, she intends to prove just that! To say Alex is intrigued by Lady Georgiana Fenton is putting is mildly. She isn’t at all the type of woman he is normally attracted to and yet, he finds himself drawn to her. With her sharp tongue, quick wit, and keen intelligence, she is match for Alex in every way imaginable. With the investigation into his brother’s demise between them, Alex finds ways to spend time with Lady Georgiana and though she often infuriates and vexes him, she also fascinates him. From Lady Georgiana’s perspective the new Duke of Fordham is a stubborn and most unusual man who, though not intended to be entitled, seems to be taking to the role quite nicely. In fact, from where Lady Georgiana is standing, Alex is ideally suited to his new role and approaches it in a far more serious manner than her late fiancé did. This, much to her great consternation pleases (and irritates 😊) Lady Georgiana.